I had intended on writing a nice long post tonight. You know. A real post. But there isn't going to be a real post. For starters, June has single handedly waged war against our pantry. I am officially giving up on cleaning up after her toddler desecration. I'll clean the house again when she turns five! Maybe six! My neighbor told me that her super mellow, easy baby then turned into the wildest toddler this side of the Mississippi. June is clearly following that same path. Long live crazy toddlers! Secondly, I still haven't recovered from the Jazz's loss to the Mavericks on Monday. It was the biggest game of the year. Mavericks and Jazz were both fighting for a playoff spot. Jazz lost which means that they are out of the playoffs, and Dallas and Houston are in. Dallas has 41 losses and both Houston and Jazz have 40 losses, but Houston won the tie breaker over Jazz. Pretty sad when a team with your exact record makes the playoffs and you don't. It's all really painful because the Jazz should have made the playoffs. They lost three very close games in the last 10 days to the top teams in the west- they lost to the Warriors in overtime, the Clippers in overtime, and then they lost to the Spurs by 2 in the last seconds of the game. A victory in any one of those games would have taken the Jazz to the playoffs. But I can't quite quit on them. And I definitely can't switch teams. I'm like Selena Gomez. I say I'm going to break up, but then I come crawling back. Every damn time. Being a sports fan is a long term relationship to me- you stick with your team in the good times and in the bad. You commit to them and you see them through their worst games and then for that you are rewarded by getting to share in the good games, the buzzer beater shots, the playoff runs, the bids for a championship. You get the finals, but you also get the flops. That may be part of the reason why this exclusion from the playoffs hurts so much- because all of my friends who were Lakers fans ten years ago (Go Kobe!) now suddenly seem to be Warriors fans (Go Steph!) and are relishing in the sweet high of a championship team, an MVP, and the all time record for most wins in any season. It's a great time to be a Warriors fan! But this seems too easy to me... to go from the high of being a Lakers fan to the high of being a Warriors fan. You don't just get to be a fan of whichever team is currently beating all the other teams. You pick one and you stick with them. If you were a Lakers fan ten years ago, that is awesome. But then you need to be a Lakers fan this year too. When the Lakers have their worst record in history. And next year when they are rebuilding and recruiting young talent and scraping buy and losing by 30 points to the championship teams--- you have to be a fan then too. And then in 5 or 7 years they'll start to make the playoffs again and maybe in 12 years they'll win a championship and you can be rewarded for the crappy years. Can you tell I'm just a little bitter over the Jazz loss? This one just stings a lot. And it doesn't quite feel fair. Because the Jazz have played SO HARD and have had more injuries than any other team (Rudy Gobert, Derrick Favors and Alec Burkes all missed weeks and weeks of regular play because of injury) but they were right there hanging on for a playoff spot and to not get in at the last second just feels like a slap in the face. Especially because Dwight Howard does get in and Dwight Howard is just the worst. And then in the midst of all of this I feel really stupid for caring this much. (For the record I bawled like a baby when the Jazz lost to the Bulls in the 1997 finals. 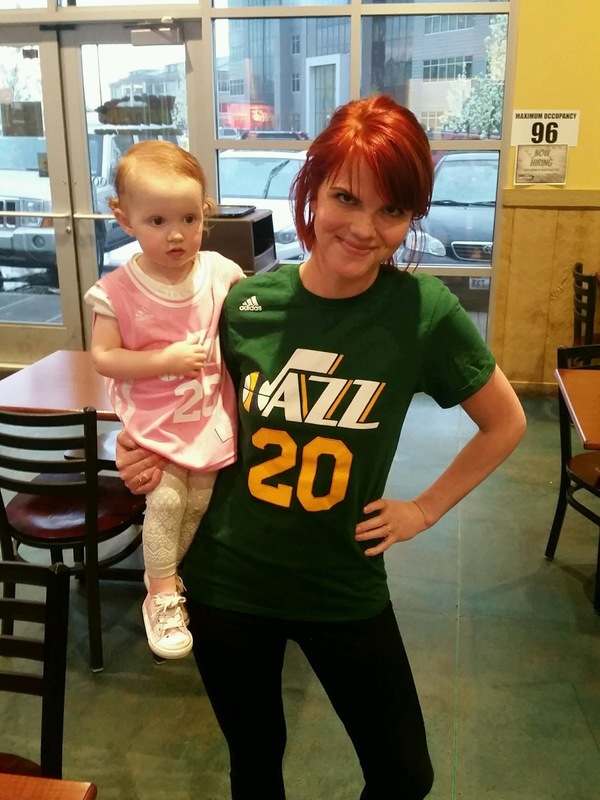 I've always cared deeply about the Jazz. And Michael Jordan was just too good.) I mean, of all the unfair, sad things happening in the world, I certainly don't need to waste energy on a basketball team that is not performing how I want them to. Thanks for indulging me on my Jazz rant. Somehow I feel better just letting this out to a bunch of strangers on the internet who probably just wanted to see what color I painted my nails today. Well, I sure fooled you, didn't I?! Also this was supposed to be a short post but it ended up LONG because I love the Jazz and it's your fault for getting me started on them. Now I absolutely have to tear myself away because I'm packing for a girls' weekend in Dallas with my college besties. Can't wait to sit poolside and gets manis and enjoy some best friend time for three days. Surely that will cure my basketball broken heart.